As regular readers are aware I suffer from migraines and so have been a looking at ways to reduce my amount of prolonged screen time. All screens area not equal, of course, and it’s mainly the length of time rather the number of ‘looks’ that makes the difference. That’s why I’m always fascinated to find out the methods of working for people, both past and present, who were not only fantastically productive, but influential as well. In the above quotation from Barthes it’s evident that the physicality of his system made a difference in a way allied to embodied cognition. Everyone has domain knowledge. The guy in the self-storage warehouse, the History teacher, the researcher. Anyone can gather domain knowledge. It’s based on experience. The value comes in adding value to that domain knowledge. The first way is to share the deep, specialised knowledge that you’ve got. Give it away. Know about obscure 1980s Japanese comics? Share it. Help people. Found a cheap way to fix that long-discontinued engine that a couple of people you know have been having problems with? Likewise. The second way is equally important. Seek out new domains. Find synergies between the two domains. Find metaphors and procedures from one that fit the other. Insights come through immersion and reflection. There’s sea of information and knowledge out there. I do the best I can, strapping together several planks by way of information channels into a raft to stay afloat. I thought I’d share those here – both online and offline sources – and I’m definitely open to suggestions and comments! A few months ago when I had to submit an outline for my thesis proposal essay, I indicated that I wanted to look at ‘changing conceptions of, and reactions to, the nature of knowledge by educational institutions.’ My feeling was (and still is) that, as George Siemens so aptly put it in Knowing Knowledge,? Knowledge has broken free from its moorings, its shackles. The five questions I framed initially I know think are a little broad: instead I intend to focus on where stimulii for change originate, examples of how changes have taken place in schools, and then what changes can be expected in the future (short to medium-term). This would allow me to discuss ideas surrounding the changing nature of knowledge, the role of educational technology and the structure of a 21st-century curriculum.? The work that I have done since September, both on my blog and the reading I have done specifically for my Ed.D., has shown me that there is a fundamental difference between ‘education’ and ‘schooling’. The former is an ideal, something almost Platonic in form, whereas the latter is the practical implementation of more abstract ideas, subject to multitude pressures from varying angles. It is important not to confuse these two notions, especially when talking about the ‘purpose’ of each. A lot of what happens in education depends on how conceptions of society, knowledge, human nature and varying degrees of optimism as to what extent the existing (fairly delicate) status quo can be maintained. For it is this stability that educational institutions strive for, over and above creativity, inspirational teaching and motivating students to become lifelong learners. Upon reflection, this has to be the case given that schooling is compulsory and schools do not, in reality, face the same market pressures as commercial entities. The work I’ve done in trying to synthesize (some of) my research so far is here. (I’ve been using the Open Source program FreeMind to do my mindmapping – I’m still getting to grips with it…)? I have a feeling that the reason that what I would term ’21st-century forms of knowledge’ are not filtering into schools is because at their core they are fundamentally anti-capitalist. Traditionally, knowledge has meant power with access to the upper echelons being available only to the privileged and/or wealthy. The Internet (along with concomitant social trends) has changed that, leading to some talking about the world being ‘flat’. It’s also tied into the idea of experts. Wikipedia has been shown to be just as reliable as the Encyclopedia Britannica, yet the former is edited by thousands of ‘amateurs’ whilst the latter is put together by a team of ‘professionals’. It’s certainly larger and a more valuable research for me, being always up-to-date and covering non-traditional information. (photo by antmoose @ Flickr)? 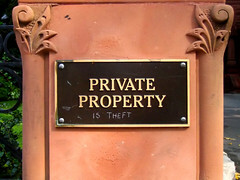 Proudhon is famous for his slogan ‘Property is theft!’ in his book What is Property? Whilst I’m no anarchist, I do believe that we have the wrong way of looking at questions surrounding the ‘ownership’ of various things. Take digital downloads of music, for example. The talk here is of ‘intellectual property’ and ‘copyright’. Nevertheless, the music industry is being forced to change the way they deal with customers and, indeed, their whole idea of the inherent ‘value’ of singles and albums due to changes in way the younger generations look at and value music themselves.? If knowledge can reside in networks as well as groups, we need to be not just ‘standing on the shoulders of giants’, but interacting with one another and collaboratively building knowledge. Many blogs and various sources of information and knowledge on the Internet (including photos posted to Flickr) are released into the wild with a Creative Commons license. Instead of focusing on the things that you can’t do with the information/knowledge/photograph/whatever, it focuses on what you can do. The license for my teaching.mrbelshaw.co.uk blog, for example, states that my work can be shared or remixed in any way you like, provided that attribution is given, it is not used for commercial (i.e. for-proft) ends, and that any resultant remixing is also released under a Creative Commons license. Compare that to the restrictive practices of the RIAA…? What does plagiarism look like in the 21st century? Can a line be drawn between that and being ‘inspired’ by another’s blog post? Where does the collaborative knowledge which comes as a result of wiki creation fit? Are examinations outdated? ?